The Bariatric No-Slip Wedge is a reliable turning and pressure redistribution solution for Bariatric Patients. 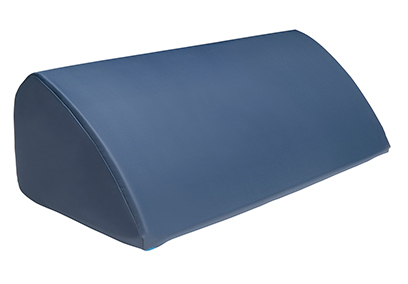 The Bariatric No-Slip Wedge is manufactured of a very firm, high density core foam that will hold the torso in the recommended 30-degree turned position, while maintaining a high weight capacity. 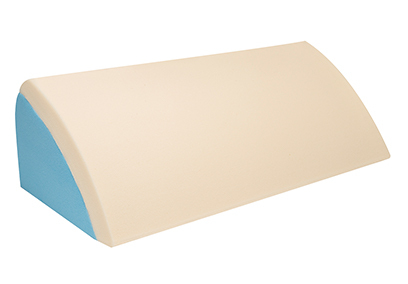 A layer of high-density Visco-Elastic Foam is laminated to the patient contact surface, which enhances comfort and pressure redistribution where it is needed most. The sides of the Bariatric No-Slip Wedge that face both the patient and caregiver are convex to create a more rounded shape, which helps to maximize the weight capacity and overall integrity of the cushion. The Bariatric No-Slip Wedge is an ideal way to address the need for bariatric turning and pressure redistribution. Consistent and reliable way to maintain a 30 degree side lying position for patients weighing up to 650 pounds. Convex Surfaces on the patient and caregiver sides make the wedge more supportive than ordinary turning and positioning wedges. Extra-firm core that supports more weight and an extra-plush memory foam topper enhances comfort and pressure redistribution. Made of high-density, anti-microbial, hypo-allergenic and latex-free foam. Covered with a skin friendly, moisture proof friction and shear reducing cover on the patient contact side with a panel of “No-Slip” fabric on the bottom. No-Slip fabric on the bottom of the reusable version prevents the wedge from migrating away from the patient. Helps to keep patients elevated for the full duration of the turning schedule. The unique shape and features of the Bariatric No-Slip Wedge are patented under U.S. Patent # 7,240,384. Manufactured of high-density, anti-microbial, hypoallergenic foam. The dimensions are 26″ W x 12″ Deep x 8″ Tall. Nylon friction and shear reducing top cover. No-Slip fabric bottom cover to prevent migration away from the patient. The cover can be cleaned with standard cleaning procedures, using properly diluted solutions. The No-Slip Wedge meets or exceeds the specifications in California Upholstery Provisions as stated in Technical Bulletin #117. Manufactured of high-density, anti-microbial, hypoallergenic foam. The dimensions are 26″ W x 12″ Deep x 8″ Tall. The No-Slip Wedge meets or exceeds the specifications in California Upholstery Provisions as stated in Technical Bulletin #117.